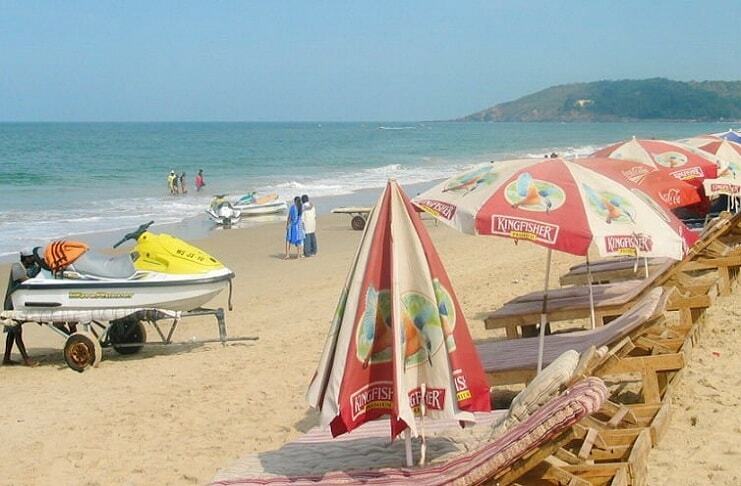 Calangute is one of the most popular beach towns in Goa. It is easily accessible from Vasco and Panjim housing nearest airport and railway station respectively. Most famous for its serene beach, large number of hotels in Calangute, different water sports, etc., the place is perfect to spend a memorable vacation. Calangute is one of most popular beach towns of Goa. Located on the northern coast of the state, the beach here is the longest in entire state. It is one of the most tourist-busy places in the state and is basically a tourist town. Well connected to Panjim, the capital of Goa and all other tourist destinations of the state, Calangute is often picked by the tourists in order to make a stay at one of the hotels while they explore the rest of the state. There exists a large array of hotels that are lined alongside the beach; it is one of the prime attributes the place is famous for. The beach in particular remains filled with tourists year long, except for monsoons when the heavy rain showers hit the place, also pausing the outdoor activities like swimming, water skiing, and parasailing. Being a highly popular area in the state, there is a large network of roads linking the place to rest of Goa. It is very easy to access the beach town from any corner of Goa. Apart from the commonly used modes of transportation like taxis, auto rickshaws, buses, etc., one could also hire the unique scooter taxis or use a bike or scooter on rental basis in order to access Calangute. Hiring a motorbike or scooter is perhaps the best and economical way to explore the beach town and rest of Goa. There are a couple of places from where one can get bikes and scooters on rent. Besides, most of the luxury hotels in Calangute also offer transportation facilities to their guests. Like rest of the state, Calangute experiences a humid and hot climate for most of the time in a year. There is quite minimal difference in climate between summer and winter. The beach remains flocked by tourists almost yearlong. However, the peak time is during winters, especially during the festive time of Christmas and New Year. Goa being one of the most culturally rich places in India celebrates its festivals and events with great fervour and joy. The good thing is that there are sufficient number of hotels to effectively accommodate the tourists. Starting from the cheap hotels to the amenities filled 5 Star hotels, there is a wide window of hotels to pick from. The most popular ones being: Hotel Tangerine, Hotel Goan Heritage, Neelams the Grand, Ocean Palms Goa, and Resort De Coracao. Calangute is quite small in area and can be easily explored on foot. If one loves to head outside, hiring a scooter on rent and exploring the town and other destinations of Goa is the best thing to do. Besides, there are a number of restaurants and shacks lined alongside the beach where one can try appetizing food from all over the globe. Swimming along with a couple of other outdoor actions like parasailing, water skiing, beach volleyball, etc. remain the most popular activities amongst the tourists. Plus, sun bathing, collecting sea shells, relishing exotic massage, etc. are some activities that help the tourist relax and rejuvenate. In a nutshell, Calangute is simply an ideal destination to relax, unwind, and create some great memories. Visit the beach resort to spend a fun vacation and pick from the best hotels; the cheap hotels in Calangute being popularly picked by the tourists.